I grew up with a very inspiring role model: my father. A loving and caring man, he left a successful career as an environmental engineer to move to Sudan. There, he worked in gruelling and dangerous conditions to help the Sudanese people become more self-sufficient. A former farmer, my dad worked the land alongside them, set up clean water basins and built latrines. Long before that, however, my dad set a good example for me at home. When I was in college, he looked after my breeding dogs during the week so that I could continue to develop my business while getting an education. It was during my college years that I donated my first puppy to an organization called Canines with a Cause. That pup, Beau, was trained as a medical alert dog for a man in a wheelchair. She helped retrieve things for him, opened and closed doors, and let others know if anything was medically amiss with her owner. I was stunned to see what a difference a dog could make in the life of someone with a disability. The unconditional love from a dog that many of us take for granted can be utterly transformational for people with disabilities. Someone who once felt isolated is no longer alone. Someone who felt judged now has a best friend and supporter. Someone who found every day a struggle has a reason to get up and carry on. I think it is fair to say that Goldendoodles—my first love as a breeder—are particularly well suited to the service role. They have the intelligence of the Poodle combined with the sweet, obliging nature of the Golden Retriever—wrapped up in an allergy-friendly package. I have always bred very deliberately for calm, good natured dogs, as well. Many of my dogs in pet homes have become excellent therapy dogs, even if they are not formally in service. At any rate, Beau got me hooked! I went on to donate many pups to organizations and directly to individuals who could benefit from a dog’s support. Eventually, I decided that I could have the most impact by placing dogs with children who are dealing with challenges. My experience with a little girl named Gracie was pivotal in this decision. I have watched Gracie, who has Autism, grow into a beautiful young lady. The pup I gave her, named Freedom, played a significant role in helping Gracie blossom. Gracie and Freedom led me to Autism Service Dogs—an excellent organization that I support again and again because I have seen the effect of their work in person. I really want to do more. As my business grows, it makes sense to formalize my approach. The SwissRidge Facebook Group has become a powerful force in fundraising. In fact, in just three years, we have raised nearly $42,000! I’ve been astounded and inspired by my clients’ generosity. Going forward, I’d like to harness that goodwill and direct it, where I can, toward specific objectives. With that in mind, I announce “SwissRidge Dogs for Kids.” My overarching goal is simple: to make a difference in a child’s life, one dog at a time. Every dollar we raise via the SwissRidge Facebook group or other activities will go into this fund and be allocated to children with special needs—by way of dogs, of course! In 2015, I expect the lion’s share of the money we raise to go to Autism Dog Services. As in the past, I intend to donate a puppy to the organization and allow them to match that pup with an appropriate child. Funds raised throughout the year will pay for the specialized training that puppy needs to best serve its family. We’re already off to a great start. Together, we raised over $3,000 from the sales of the SwissRidge dog calendar. I know we’ll raise many thousands more at the annual Doodle Romp. This summer, I will select with great care what I consider to be an absolutely perfect tri-coloured Bernedoodle—the pup I would keep for myself—and donate it to the fundraising effort. This pup will go to the highest bidder. It will be an opportunity for people on the waiting list—or any other approved bidder—to leap to the front of the line and collect the “breeder’s choice.” I will reveal the selected puppy first on the SwissRidge Facebook Group, with auction details. So please join the group, if you haven’t already. Expanding my charitable outreach is another one of my cherished dreams coming true. I could not be more thrilled that my clients support this effort, and welcome any and all ideas for fundraising you may have. I know we can do some great work together. 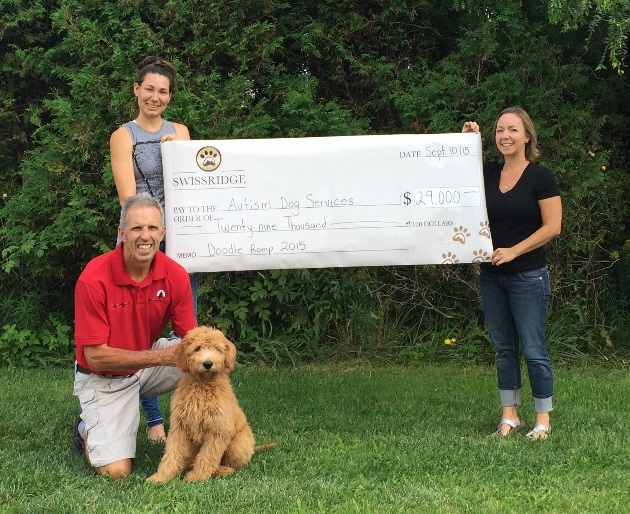 2015 charity: Raised $29,000 which was donated to Autism Dog Services along with one of our lovely Goldendoodle pups. Thank you Karley Gittens for all your hard work.